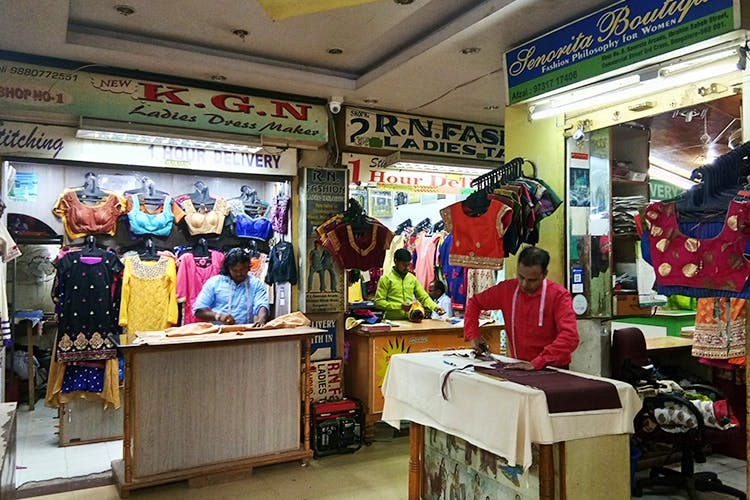 Wedged into a corner of Ebrahim Sahib Street, Samruta Arcade is two-floors of tailoring shops that make blouses and salwar suits. Prices start at just INR 450. Want to be spoilt for choice when choosing a tailor? Then, make your way to this hidden complex that’s just off Commercial Street. Go past the Dupatta Centre, that stands at the edge of Narayan Pillai Street, and you’ll find a narrow opening that’ll bring you to the doorstep of Samruta Arcade. Spread across a couple of floors, the complex is jam-packed with tailoring shops. All of them pretty much offer the same services. Fashionable blouses in silks, cottons, and every other imaginable material. Since there’s so much competition between the shops, the prices are easy on the pocket and you can get a plain blouse for as little as INR 450. Embroidery and zardosi work are also possible here.Ladies also prefer the tailors here for everyday salwars and suits. You can get simple, no-frills designs done. And you can get your orders in a week. Many of the shops here promise 1-hour deliveries, but we would take that with a pinch of salt.